Whether shrubs or ground cover (above), proper pruning adds to not only the proper look of your landscaping design…but health, as well. Whether it’s necessary cleanup after a wind storm, or, the timely maintenance of your prized ornamental trees and shrubs, Ever-Green offers every service necessary to keep your property at the peak of health and visual appeal. The fact is, whatever you plant, from shrubs to grass, most everything that grows needs a trim from time to time to maintain shape, its proper look, and health. Even the ivy that adorns the walls of Chicago’s Wrigley Field gets a periodic pruning to maintain its perspective in terms of the overall look of the ballpark. 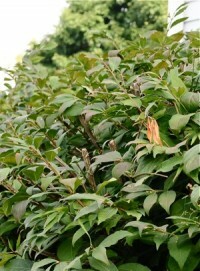 A popular variety, Burning Bush, before pruning…..
….and after pruning. Notice the difference in appearance and scale. The same is true with anything you plant on your residential, or commercial, property. 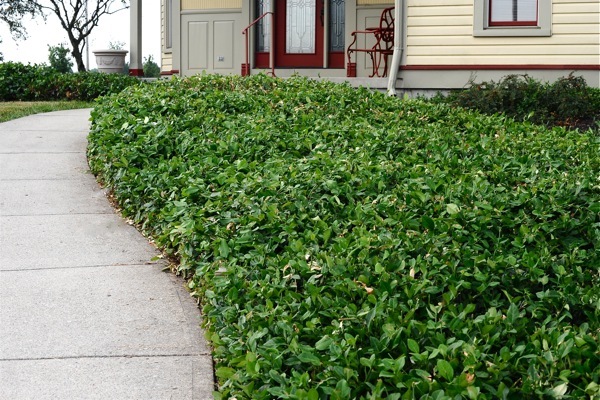 Even ground cover, like the above photo, looks better and healthier with normal routine maintenance. 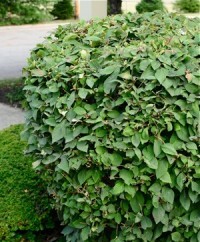 With shrubs, whether evergreens or the common and popular burning bush (pictured here), size must be maintained to ensure the proper physical perspective to the rest of your property. No bush should cover the window, for instance. The difference in the two photos shown is more than enough graphic evidence. And increasingly, more and more people are planting fruit trees for not only spring color and visual impact…but for a delicious harvest, as well. But, you must prune apples, peaches, and even cherries, for maximum benefit and yield. Remember, you plant for the sake of visual appeal. But like the grass in your lawn, you have to periodically care for the growth, look, and health of your planting by giving it a trim. Whatever the occasion, whatever the need, remember Ever-Green is qualified and expert in keeping your landscaping pruned and trimmed to perfection. Call us today!